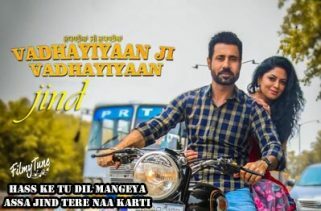 Vadhayiyaan Ji Vadhayiyaan is a Punjabi Comedy Movie 2018. It is starring Binnu Dhillon, Kavita Kaushik, Jaswinder Bhalla, Karamjit Anmol, B.N. Sharma, Upasna Singh & Gurpreet Ghuggi. The Director of this film is Smeep Kang. Production Companies are A & A Advisors present and Naughty Men Productions. The Movie will release on 13th July 2018. The Story and Screenplay writers are Vaibhav Suman & Shreya Srivastava. Producers are Atul Bhalla, Amit Bhalla & Binnu Dhillon. Jatinder Shah has composed the Music. Vinder Nathumajra, and Happy Raikoti are the Lyricist. The Singer are Gippy Grewal, Gurlez Akhtar, Ammy Virk and Raman Romana. The Music originally belongs to white hill music.